Here is a wine that is reminiscent of an expensive bottle of coveted red pulled from a beloved cellar to be shared with those who appreciate the benefits of aging. It does not offer blunt, youthful fruit, but rather grace and a refinement that only comes from time. We have stepped outside Santa Barbara County to access some amazing fruit. 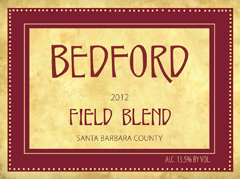 The Syrah is from Slide Hill Vineyard in the cool Edna Valley AVA of southern San Luis Obispo County. The vineyard is Demeter Certified Biodynamic, a unique method of organic farming that is very exacting and produces dense, highly structured fruit. 100 percent Syrah, this is a blend of five different Syrah clones from three distinct blocks.